When I first set out on my venture to teach what I know it was with the clear intention of teaching from the heart. To encourage as well as inspire. To ensure that every person coming to a workshop, be it in crochet, mosaic or needle felting not only leaves with a beautiful creation and a new skill but most importantly a deeper sense of their own innate creative capabilities. It always amazes me how many people I meet who tell me they are not creative....of course I take this as a challenge! So it was my absolute pleasure yesterday to host a needle felting workshop with Lydia Needle of Blackdogandgingercat. We had the most wonderful time being taken through each step in the creation of a magnificent needlecelted Hare. She was patient, funny and always encouraging. It didn't matter one jot if all of our ears or arms or bodies (felted ones not our actual ones!!!!!) were completely different to each others she reassured us that they were all perfect ..... and of course they were. I spend so much time teaching others that I had neglected the importance and value of being on the receiving end, to say nothing of the sheer delight of getting to the end of the day and proudly displaying my Hare! Sculptural needle felting is in a whole different league to the sort of felting that I do. My workshops are about instant gratification and the joy of working with bright colourful wool. 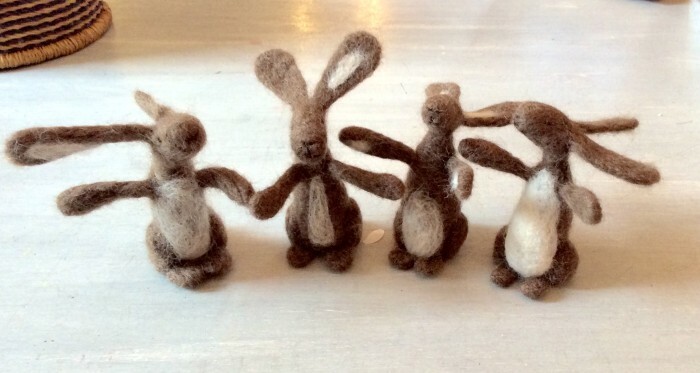 With me you get to explore the basics of needle felting whilst making decorative pieces for the home. All of this can be achieved in two hours by anyone and you have great fun in the process. Sculptural needle felting in the manner of Lydias work takes time (making a Hare really did take us 6 hours!) and it's a process that is best learnt under the watchful eye of a skilled professional. So, I just wanted to share this with you all and to say a really big heartfelt thank you to Lydia. I am looking forward to our next workshop where we shall be creating Reindeers for christmas and if you would like to join us you can book here. Places are limited and several people have already booked so there are only a few places left. We shall be returning to Hares and Bares spring 2015 so watch this space.